As May approaches, the Hepatica has finally faded for another season. One of the things that I enjoy the most about hepatica is that it is not boring. 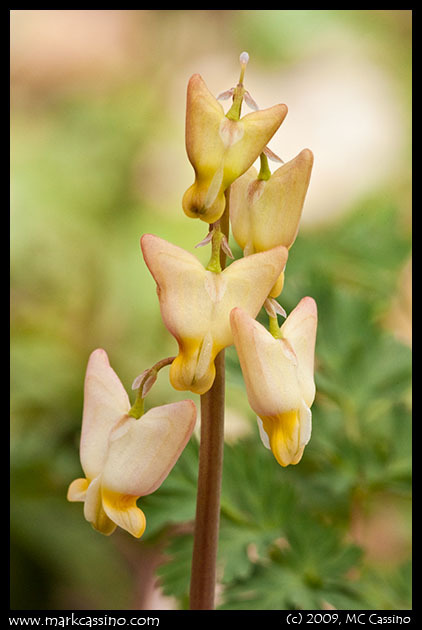 Many other flowers – wild or cultivated – appear in essentially one form. Consider Spring beauty, Trillium, Marsh Marigold, or other spring wildflowers. 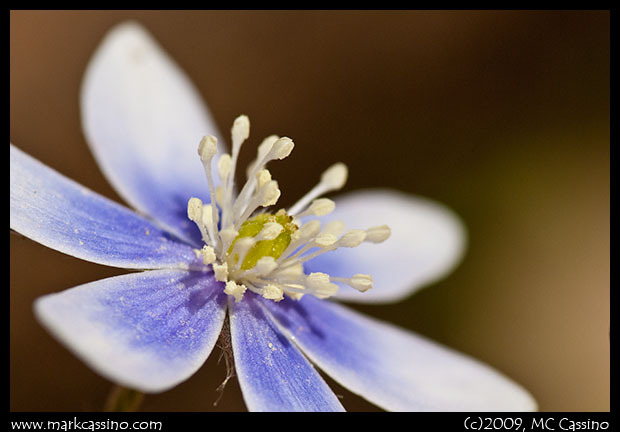 They have the same coloration, same number of petals, and often grow in the same formations. Spring beauty, for instance, often grows a pair of flowers, situated slightly diagonally to each other. Hepatica, on the other hand, demonstrate a lot of diversity. They may have 6, 8, 10, or more petals. They may be solid or multicolored, dark or light - deep blue, pale lavender, or even white. 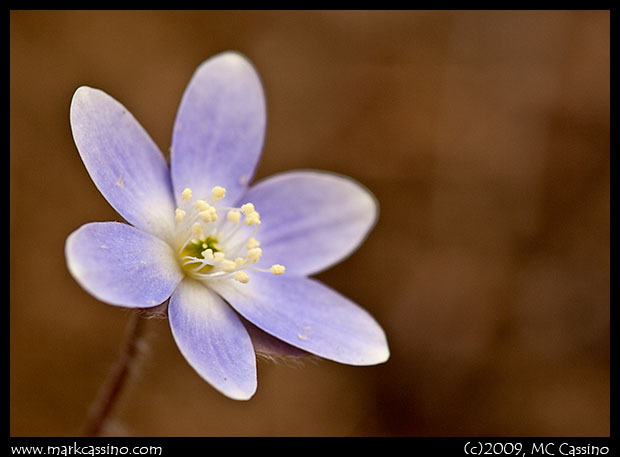 Some time ago I likened hepatica to snow crystals – although they are similar, each one is slightly different and unique. Combine that with their arrival as one of the very first spring wildflowers, and the rather short period of time they are around each spring, and you can see what makes them so interesting to photograph. Yesterday I visited a few choice locations in Cass County, Michigan, looking for spring wildflowers. Our long cold snap seems to be coming to an end, and Michigan might actually see temperatures in the 70’s for the first time in 2009. Combine that with some recent rains, and it seemed that the wildflowers would be breaking out for sure. The forest floor is now covered with large patches of wild leeks the earliest wildflowers are still out – Harbinger of Spring, Skunk Cabbage Flowers, and Hepatica are still abundant. Most of the skunk cabbage has moved beyond the flowering stage, and is now sending out its green napkin sized leaves. Bloodroot is also out, and is probably near its peak in many places. Here and there I found withering blooms or plants that had already lost their blooms, but most were still fresh. The next wave of wildflowers is starting to make its appearance. Marsh Marigolds are starting to open up a bit more. 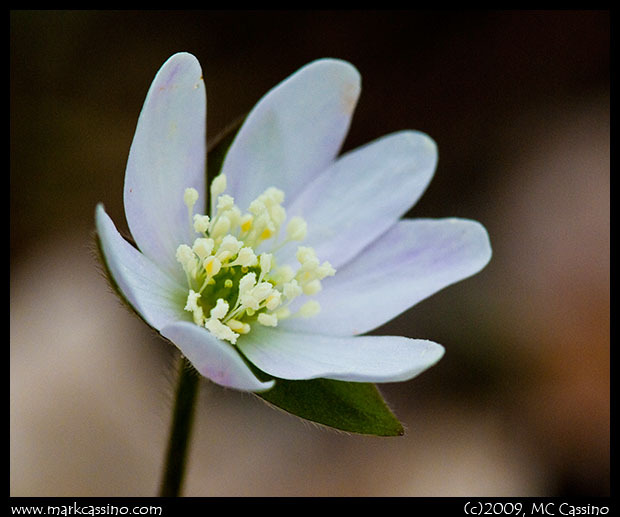 Rue anemone and false rue anemone were just starting to bloom in the places I visited, but along the way I saw solid patches of them by the side of the road. Spring beauty is also just starting to appear. I found a few Dutchman’s Britches, just starting to bloom, one of which is shown below. Trillium leaves are now up, and a few budding flowers have started to crack open. May Apple foliage is also pressing out of the ground, though it is just starting to unfurl. Woodland wildflowers have carved out a tenuous environmental niche for themselves. They spend most of their time dormant, or nearly dormant, under the forest floor. For a few short and cool weeks in early spring, before the forest canopy leafs out, they soak up the rays of the sun and gather most of the energy that they’ll use for the remainder of the year. Someone once told me that trout Lilies send up a few leafs every spring for several years, and only then have stored away enough energy to send forth a flower. Nonetheless, an undisturbed forest can be literally carpeted with spring wildflowers during those few short weeks – a testament to the success that these plants can enjoy. It’s logical to assume that if the land is disturbed, these wildflowers will be eradicated form the area, or at least severely compromised. Places like the Dowagiac Woods, which is one of the very few areas in Michigan to have never been logged, are rich in these spring wildflowers. On the other hand, the vast wooded areas of the Allegan Forest, which were originally clear-cut to provide wood to rebuild Chicago after the great fire, and then were devoted to farming in many areas, have few spring flowers. 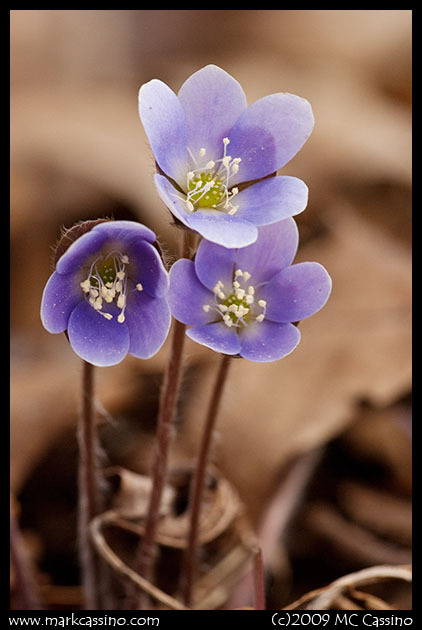 Nonetheless, there are a few places in Allegan where hepatica not only bloom, but are really quite abundant. 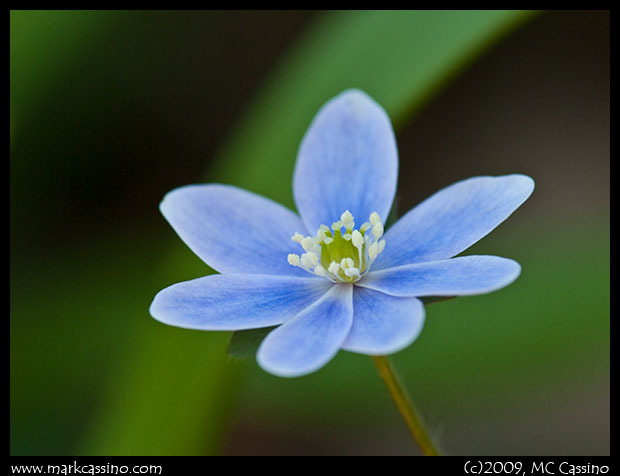 One is off 125th Ave. near the river, where there is a steep, south facing bluff which sprouts lots of Blue Hepatica in the spring. It’s a nice site and there’s a blocked off roadway cut into the side of the hill, which makes for easy access. You can wander along the roadway and slowly descend from the top of the bluff to the banks of the Kalamazoo River. 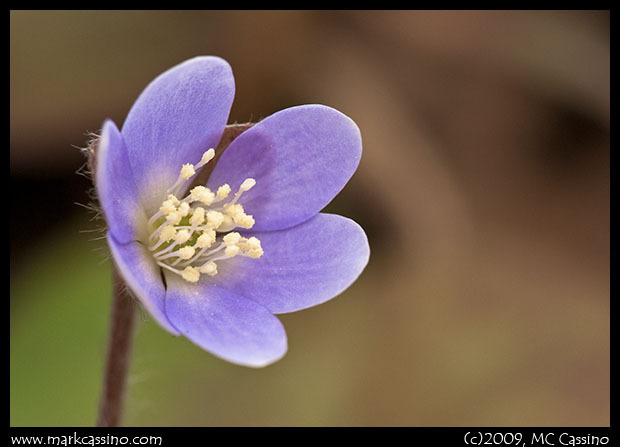 Hepatica is abundant above, below, and even on the roadway. 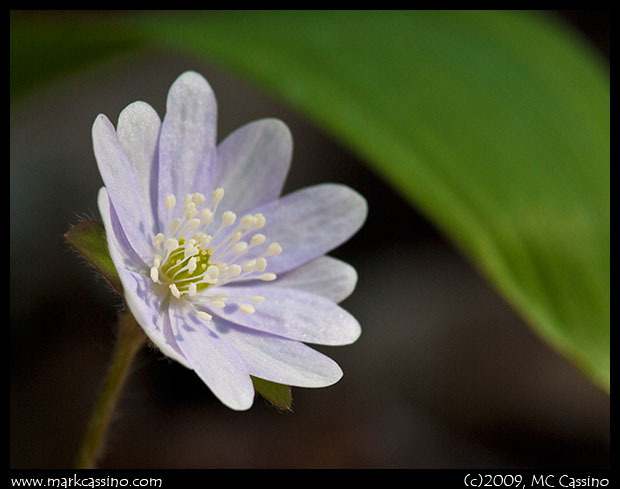 But as soon as the river takes a bend to the north, and the side of the bluff faces west, hepatica is hard to find. Maybe the favorable micro-climate on the south side of the hill promotes the growth of these flowers. But in this one spot, at least, the hepatica abound. Today I went looking for spring wildflowers, and happily, found some. I visited a few sites in Cass County, Michigan. In the early morning, I was a bit disappointed – Harbinger of Spring was blooming, but nothing else. But after a few hours the hepatica suddenly burst onto the scene. It’s amazing to walk into a woods seeing only a few flowers, and then to walk out a couple hours later and see myriad flowers blooming. Aside from the harbinger of spring, tons of hepatica blooming. I also spotted one marsh marigold, which was way out in a marsh, so no photo. To my delight I found a couple of bloodroot blooms. It’s still early in the year, and skunk cabbage buds are still pushing up from the muck. 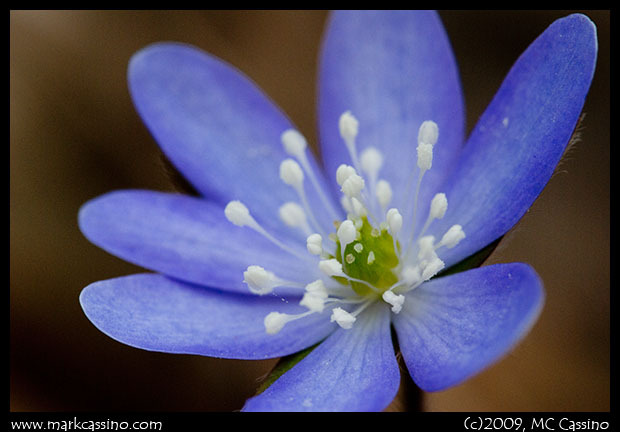 Here’s a photo of a hepatica bloom, taken early today, more photos will be coming in the next few days.